Chilean President Michelle Bachelet may turn out to be a better president than her predecessor Sebastian Pinera, but many pro-democracy activists in Latin America may well come to miss his recent views on Venezuela, Cuba and other authoritarian regimes. Bachelet, a Socialist former president who returned Tuesday to the presidential palace for a second term, suggested during her campaign that her top foreign policy priority will be to improve ties with Brazil, Argentina and other Atlantic rim South American nations. Pinera, in turn, had stressed Chile's ties with the more pro-free market Pacific Alliance, made up of Mexico, Colombia, Peru and Chile. In her first press conference after her inauguration, Bachelet announced that her first foreign trips will include Argentina, and that Chile will pursue "a very strong Latin American agenda." Asked about Venezuela, she said that Chile will "accompany the Venezuelan people and government," and added - in what some saw as a nod to the Venezuelan government - that Chile will "never support any movement that violently wants to topple a democratically elected government." Asked about Bachelet's comments on Venezuela, Human Rights Watch Americas' director Jose Miguel Vivanco told me that he is not worried about it, because it is consistent with Chile's past stances in support of democracy and human rights. He added, "Let's judge Chile on its positions, rather than on its speeches, on Venezuela." In a recent interview before he left office, Pinera told me that Latin American countries should be much more forceful in their defense of fundamental freedoms and human rights in Venezuela and Cuba. Pinera, who was the only Latin American leader who met with a Cuban dissident leader during a Jan. 28 Latin American summit in Cuba, told me that "all Latin American countries are committed by regional treaties to defend freedom, democracy and human rights, not only within our borders but also outside of them, and particularly in our continent." "Cuba undoubtedly has serious problems with freedom, with democracy and with human rights," he said. "That's why I used the occasion of my trip to Cuba to meet with the Cardinal of Havana, and with the leader of the Ladies in White, which is an organization that fights within Cuba for the freedom of political prisoners and human rights." Citing regional treaties of the Organization of American States, Community of Latin American and Caribbean States and other regional institutions, he said that "in modern international law, it is not only a duty for each country to defend freedom, democracy and human rights within its borders, but also to protect them in all other countries." Asked what he would recommend Bachelet do about Cuba, Pinera said he would advise her to be "coherent and consistent, and that means to defend freedom, democracy and human rights, not only within our borders, but wherever they are being threatened." My opinion: To be fair, Pinera's most vocal human rights activism came at the end of his government. As for Bachelet, she was generally a strong defender of democracy and human rights during her first term, except for some occasional blunders, such as when she happily visited Cuba - a dictatorship that officially censors books - to inaugurate a government-sponsored book fair. I tend to believe that Bachelet's vow to improve ties with Argentina and other populist authoritarian countries is part of her rhetoric to gain credibility among her pro-Venezuelan neighbors, and that it won't mean a U-turn in Chile's defense of basic human rights and democracy in the region. Because of her personal history - her father was tortured and died during Chile's 1973-1990 military dictatorship and she was forced to live in exile - and her past commitment to human rights, I doubt that she will follow the steps of the presidents of Argentina, Bolivia and Ecuador, among others, who are enthusiastically supporting Venezuela's repressive government. It would be a real loss for the region. 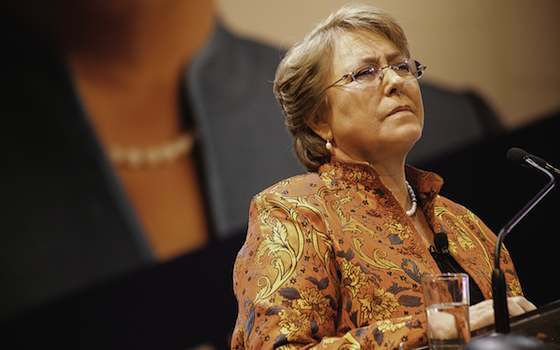 "Bachelet's Chile Moving Closer to Venezuela?"